Dr. Tetzlaff prepares for his interview with CBC at ICORD. 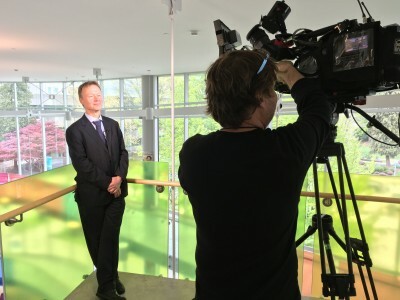 ICORD’s Director, Dr. Wolfram Tetzlaff, was interviewed by CBC’s The National to comment on a recent paper published in Nature. Researchers at Ohio State University in Columbus used a surgically implanted device to record the brain activity of a study participant with quadriplegia, which then connected to a neuromuscular electric stimulation device on the participant’s wrist. After 15 months of training, the participant, who sustained a cervical spinal cord injury four years ago, was able to use the brain-interface system to regain the ability to move his wrist and fingers and perform a number of simple tasks, including playing a video game. ICORD Principal Investigators Drs. Gary Birch and Jaimie Borisoff have done similar research on brain-computer interfaces using a non-invasive EEG cap, which recorded brain activity and were used by able-bodied participants and those with SCI to control a video game. “This new research is something that has to be performed on the road to making these types of systems feasible and ultimately available, but neuromuscular electrical stimulation, for instance, has been available for many years and we’re still not seeing it in long-term and widespread use in people with SCI,” said Dr. Borisoff, who added that long-term questions of engineering and safety are yet to be answered about invasive brain interfaces. Dr. Borisoff sees both non-invasive and invasive types of brain-computer interfaces being continued areas of research, but while surgical implants yield much richer brain activity data than non-invasive methods, they do come with the risk of complications that accompany any surgical implant. “It’s a classic risk-reward trade-off,” he said. He also suggests that this research might reveal therapeutic effects in retraining motor function in individuals who have experienced neurotrauma, thus potentially allowing for short-term use scenarios. This might ameliorate the questions about the use of implants over longer-terms. “If you could have a brain-computer interface that could tell you what the brain is doing while training with neuromuscular stimulation, that could be very useful for using this technology for rehabilitation purposes,” Dr. Borisoff said.